Heat oven to 325°F. Grease bottom of 8-inch cast-iron skillet with shortening. Make brownie batter as directed on box for cakelike brownies. Spread in skillet. Bake 38 to 41 minutes or until toothpick inserted in center comes out almost clean. Cool 30 minutes. 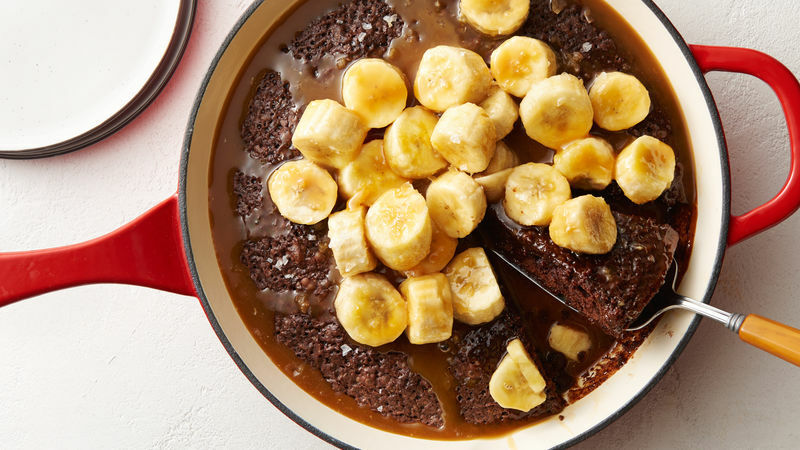 In medium microwavable bowl, mix caramel topping and bananas. Microwave uncovered on High 1 to 2 minutes, stirring after 1 minute, until bananas are softened and warmed. Pour on top of brownie. Cut into wedges; sprinkle with sea salt. For extra indulgence, serve with vanilla ice cream! Microwave ovens vary, so carefully watch to avoid burning or overcooking the caramel.